Maestro Raychev worked with Europe's key symphony orchestras including La Scala in Milan, Paris' National Opera and London's Covent Garden. In the last few years he has been conducting the orchestra of the National Musical Theatre in Bulgaria, after spending years as a conductor and director of the National Opera and Ballet in Sofia. In the year 2000, Maestro Raychev received the highest-rank BG state order - the "Stara Planina" First Degree Order for life achievement. Ruslan Raychev was closely connected to Plovdiv musical life - in the period 1951-56, he was the chief orchestra conductor of the Plovdiv Symphony Orchestra. Plovdiv was also the place where his son Petyo got born. 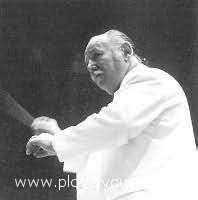 The Maestro died on January 8th 2006.